Whether acute or chronic, the indigestion and pain associated with gastritis may lead you to make changes to your diet. Separately, rice, coconut milk and aloe vera may offer some relief, from ease of digestion to possibly protecting the lining of your stomach. Consult your doctor to help you determine which foods and supplements are safe for your specific needs. A bland diet used to be the go-to diet for people with gastritis, but now it's only recommended if it helps manage symptoms, according to the University of Maryland Medical Center. A bland diet includes foods that are soft, easy to digest and mildly flavored. 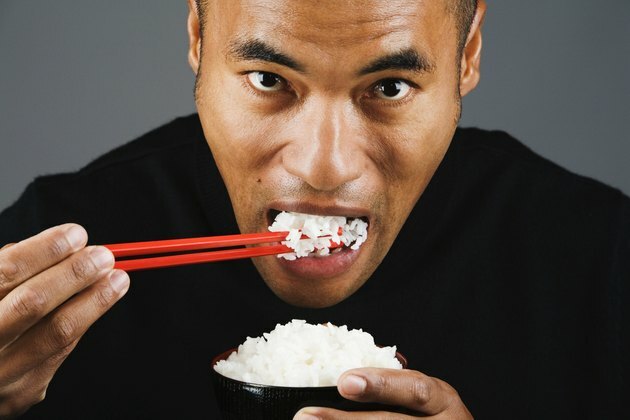 White rice is a bland food, and you may find it easy to tolerate when your gastritis is flaring up. To add some flavor without exacerbating your symptoms, you can boil your rice in low-sodium broth. Eating a fiber-rich diet may help improve your gastritis, according to the medical center, by helping digestion and preventing constipation. Brown rice and coconut milk both contain fiber. One cup of cooked long-grain brown rice has 3.5 grams of fiber, while the same serving of canned coconut milk has 6 grams. Adults should eat 20 to 35 grams of fiber a day. Aloe vera may offer some protection against stomach inflammation. A 2011 study published in the International Journal of Molecular Medicine found that an aloe vera polymer helped protect, in part, against alcohol-induced gastric ulcers in mice. While this study showed some potential benefits of aloe vera juice in helping manage gastritis, human studies are needed. Additionally, taking aloe vera orally can cause stomach upset. If your gastritis is caused by an infection with Helicobacter pylori, eating foods rich in flavonoids may help prevent the bacteria from growing, reports the University of Maryland Medical Center. Flavonoid-rich foods include apples, cranberries and their juice, celery and onions. To decrease stomach inflammation, it's also helpful to limit your intake of foods high in fat, such as fried foods, butter and high-fat meats. What Should People With Sensitive Stomachs Eat?